Hodgson and Douglas developed a Conceptual Master Plan and Construction Drawings for 1700 Midtown Apartments, located in Midtown Nashville. Included in this design were plans for the interior courtyard space as well as the surrounding streetscape. Working directly with the architect, HD created a simple contemporary design to complement the building. HD also utilized sustainable design practices by using low maintenance plant material and utilizing rain water as a feature in the design. The courtyard has been well received by building occupants and received a 2011 ULI Excellence in Design Award. Hodgson Douglas developed plans for the pool courtyard as well as the motor court. The main courtyard is divided into two levels separating the pool deck from a large outdoor gathering space that includes outdoor kitchens and a fire table. The motor court creates an inviting sense of arrival for prospective tenants using intricate paving patterns and walls. Scope of work included details of paving patterns, light fixtures, site furniture, pool and other water features, planters, drain locations, detail grading in the courtyards, rails, steps, and planting and irrigation. Hodgson and Douglas is currently involved in the design of the streetscape, elevated courtyard and roof garden for the Bravo Condominiums located in the heart of Music Row. HD came up with a formal design for the courtyard which is nestled amongst the building and elevated from the street. Accentuating on the symmetry of the architecture, the courtyard provides a series of spaces for residents to gather and relax. Ornate details create a motif that carries throughout the site. Overhead structures and planting give the space a human scale. Hodgson and Douglas developed the perimeter streetscape as well as the courtyard and courtyard pool. Hodgson Douglas developed hardscape and landscape plans for the perimeter streetscape including a bioswale directly adjacent to residential units and the parking garage. 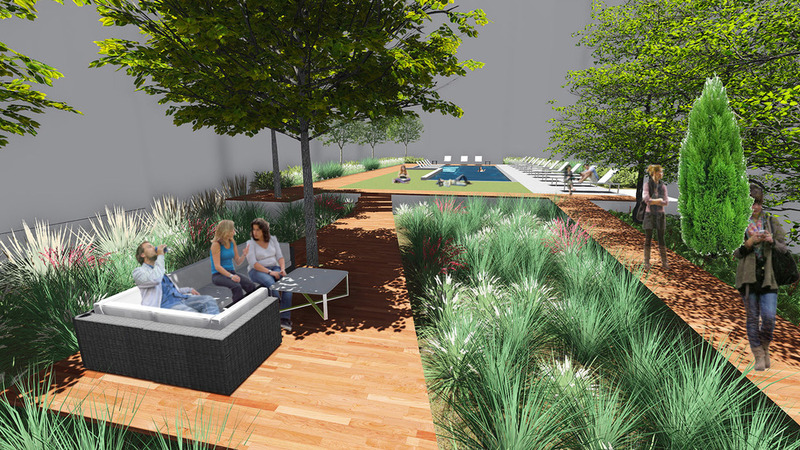 Hardscape and Landscape plans were also developed for the private Roofdeck amenity space. Hodgson Douglas developed hardscape and landscape plans for the perimeter streetscape, 2 courtyards, and a roofdeck lounge. The streetscape design creates a sense of arrival at the corner of 5th Street and Woodland Street, creating a transparency between and uniting the public with outdoor café users. The “Farm to Table” courtyard/amenity area includes perimeter bio-retention to handle drainage from the immediate area and aid in stormwater quality. There is also edible vegetation in community garden plots and an outdoor kitchen, intended for use by residents in the “farm to table” lifestyle. The pool amenity area is the largest amenity space on the project. It contains a 4’ deep pool with 6” sun shelf and a large pool deck which includes a multi-use lawn that wraps around the pool. This courtyard space also focuses on stormwater collection and quality, similar to the Farm to Table courtyard. More of an active recreation space, the pool courtyard will serve as a space for swimming, bocce, and other multi-use activities for residents. Hodgson and Douglas developed the perimeter street scape as well as the courtyard and courtyard pool. Hodgson Douglas developed plans for the amenity area of The Legacy at Jordan Lakes residential development including the planting and paving design, tennis courts, a playground, and walking trails. The Amenity Area will also include a clubhouse with pool and lounge areas, and an outdoor kitchen with gathering space. Scope of work included overall site planning, grading, planting design, and the design of the playground area. HDLA, working alongside SGS, was commissioned by LIV Development for all Landscape Architectural services for a new urban garage wrapped Multifamily building with ground-floor retail. HDLA was responsible for the design and documentation of all new streetscape design, pool amenity courtyard, games courtyard and skyline terrace (over a garage podium). HDLA worked closely with the design team to create spaces that complimented the architecture, blended with the interior design and met the programmatic needs of the owner. HDLA also designed custom trellis structures and furniture for all courtyards. HDLA was commissioned to be the Landscape Architect for River House, a new high end multi-family project within Rolling Mill Hill. HDLA created a design of a multi-level amenity deck that overlooked the rolling hills to the east. The designed program included a custom trellis that extended from the building, a large gathering space for residents, pool, pool deck including custom ipe furniture, built in outdoor kitchens, rooftop lounge overlooking the pool, and several other terrace amenity spaces. HDLA also designed all of the project streetscapes surrounding the property, including the design of a community plaza across Middleton Street. Hodgson and Douglas developed a Conceptual Master Plan and Construction Drawings for Tapestry Town Center in Brentwood, Tennessee. Included in this design were plans for the three interior courtyard spaces as well as the surrounding streetscape and creek restoration. Working directly with the architect, HD created a simple contemporary design to complement the building. HD created a design theme for each courtyard using vibrant colors and graphics in an effort to ‘brand’ the space and create a sense of place. HD also created flexible spaces that could accommodate small gatherings as well as large parties.